Laser Spine Procedures can help you get your life back! Dr. Prasad understands that pain, especially when chronic, is something that no person should have to live with. His extensive experience with pain management and Laser Spine Treatments allows him to offer patients the relief they deserve from suffering. Dr. Prasad Lakshminarasimhiah (Dr. Prasad) is a board-certified physician in Pain Medicine and Physical Medicine and Rehabilitation working with the Texas Pain Relief Group. 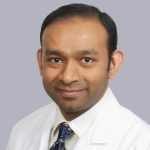 After receiving his medical degree from Bangalore University in India, his interest in the field of Pain Medicine was piqued while doing a clinical rotation in Comprehensive Pain Management at the Wayne State University in Detroit. He was able to witness first-hand the impact of modern technology, cutting-edge research, education, and a multi-disciplinary approach toward pain management. Dr. Prasad is passionate about providing patients with a wide spectrum of customized treatment options. He served in the United States Army, in the capacity of a major, at the San Antonio Military Medical Center in San Antonio. After receiving training in interventional pain medicine, his interest in this specialty was furthered while caring for injured soldiers. He has also provided care in physical medicine and rehabilitation at several locations throughout the country. Dr. Prasad’s treatment philosophy is based on a holistic, evidence-based care approach. He favors conservative treatment along with physical rehabilitation, regenerative medicine and behavioral support when indicated. His experience and education allow him to provide each patient with tailored, thorough care and a highly effective course of treatment. In addition, he utilizes interventional techniques for patients whose pain does not respond to conservative treatment. Dr. Prasad enjoys spending time with family and friends. His personal interests include playing tennis, travelling and exploring the nature. He also participates in community charitable health fairs for the underprivileged. Mr. Peninger, we value you as a patient and thank you for your kind review. Our team aims to deliver an excellent experience at every visit. We'd so appreciate your taking the time, when possible, to tell your family and friends about us. You can also follow us on Facebook at @physicianpartners! We look forward to continuing to providing quality service during your future appointments. This DR. needs an award for all he does! He explains in detail and has lots of respect for his patients. I highly recommend him to anybody! We strive for 100% satisfaction, and it is great to see you had such a positive experience with us. We'd so appreciate your taking the time, when possible, to tell your family and friends about us. We look forward to providing quality care during your future visits! Dr. Prasad is always extremely attentive, caring and compassionate. He listens to the patients needs and sets individual plans to help them manage their pain. I’m incredibly impressed with his bedside manner and his knowledge. Definitely the best around. Jessica, we are glad we are helping you! Dr. Prasad and his team thank you for your kind words. Dr. P has a great view of pain management and he has a great sense of humor to help alleviate your concerns. He is direct and extremely helpful in getting down to the issue of tha pain and helping take care of my pain in my neck due to degenerative Discs. I recommend his without reservation. The best pain management doctor in the DFW area. Great experience with this doctor and his office. Thank you Dr Prasad for caring about me and my pain. Dr. Prasad is awesome! He listens and cares about your pain. He has a great staff that also cares. Thank you Dr. Prasad for caring for me and my husband both. Thank you Dr Prasad for caring about my pain. Awesome staff in his office as well. Dr Prasad listens, is knowledgeable, and understands what his patients are going through. Dr. Prasad was very educated and looked at my symptoms as a whole before deciding what he thought my conditions were. He was very stern about pain management, but if you really are honest with him and work together I believe he will be a good doctor for anyone. Very rare to see a doctor look at your conditions as a whole - rather than judging you for whatever reason. Dr. Prasad is an Excellent Dr! He is personal and gets to know his patients. He has done 4 procedures for me. The staff is amazing too! They will go the extra mile for you. My pain has always been a 10 and he does get to a 1-2. I highly recommend this Dr. and practice! He is the only Dr. I trust with my pain! I also have to say we were able to help me get through my wedding with on how to manage the pain and help me design a plan. Its not always about the meds. Just like time management its how well you do with pain management. Dr Prasad truly cares. Great bed side manner and looks for the best way to help your pain. I would recommend Dr Prasad to anyone! Dr Prasad was so very nice to my husband, he gave him hope when their wasn't any, and he made him feel so much better after he left his office. He really has tremendous bedside manor, and that meant alot to me and my husband. Staff was very friendly and made me feel very comfortable. Dr. Prasad was excellent. He took time to truly learn about my pain and develop a plan while explaining the process along the way. I know I’m in good hands with Dr. Prasad and his team! Straight forward and to the point. Helpful Doctor. Thank you for the great review! We value you as a patient. Unbelievable! Dr. Prasad has been great--staff too. I was pretty sure I needed to get cortisone shots for a bad shoulder. Thought that would be ortho guy giving me a shot. Dr. Prasad did a procedure in day hospital where he could see exactly where the needle should go with x-ray. Pain is gone! Much thanks to Dr. Prasad and his staff! Got injured after a fall and was in severe sciatica pain.Felt humble that so much can happen without our control!.Our family doctor referred to Dr.P.He explained for the first time what was the problem, pinched nerve.MRI test confirmed it and got epidural inj with very good relief.He was very compassionate throughout. He then referred me to therapy and told us how imp it is to exercise regularly and lift and bend correctly during day to day work. Now I'm back at work. Thanks a lot Dr.P. + Experience - physician listens, compassionate, knowledgeable. It is always good and fair minder. I have been seeing Dr. Prasad for some time and think highly of him and his people. It's a lengthly drive for me but he and his people are worth it. Worst results. He was a no show for the 1st ESI injection. The 2nd ESI did nothing. He didn't see me on the follow up. His P.A. said we had to start over - 3 more ESIs. I told her & his staff that I was done with him - cancel everything immediately. His staff told me they would accept my insurance (Scott & White PPO). They did not. In fact, I was balance billed $11,500. His billing company, Physcian Partners of Amercia returned no calls in 5 months. Very unprofessional & deceptive & unresponsive. Take the Dallas North Tollway N. Exit at Gaylord Parkway/Warren Parkway and go left. Follow this road to our clinic. It will be on the left side before the Frisco Fire Station. Take TX-121 N. Continue onto the Sam Rayburn Tollway. Make a left turn at Legacy Dr. Then turn right onto Warren Pkwy. The clinic is on the right side after passing the Frisco Fire Station.